Celtic manager Neil Lennon is confident striker Leigh Griffiths will remain at the club next season. The SFA charged Griffiths over footage of him singing a song calling former Hearts player Rudi Skacel "a refugee". The police are also investigating and Lennon said he would educate the striker on appropriate conduct. "We will do all we can to help him along," said Lennon. "He knows now there is a responsibility to the way he behaves." Video also emerged of the 23-year-old striker chanting about the possible liquidation of Hearts. 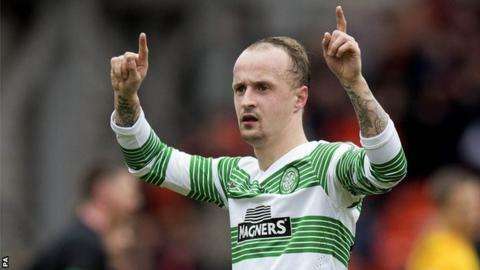 Griffiths has already been disciplined internally by Celtic and the player has apologised to the Edinburgh club. "There is no question he has a few issues that we all have in our private life," said Lennon. "He has been open and frank about it with me. "At times, I think he gets antagonised by people and he just needs to learn to take a deep breath and walk away and at times that is not the easiest thing to do." Lennon previously said that "any sign of any sort of racism against colour, religion, background will be an instant sackable offence" at Celtic and stood by that comment when speaking at the club's Lennoxtown training complex on Friday. He was also mindful of the fact that Griffiths walked free from court on Thursday after a charge of assault against him was dropped. Celtic chief executive Peter Lawwell has discussed with Lennon the controversy that has embroiled Griffiths, who joined Celtic from Wolves in January, signing a four-year deal on transfer deadline day. "There is a police investigation going on and we are doing our own internal investigation as well and they will run parallel with each other and we will take a line from the police on that as well," added Lennon. "I have spoken to Peter and he has spoken to me about what is going and on and we will deal with it as it comes. "He has a few adverse headlines over the few weeks, but he is our player, my player and if there is a part of re-education or education or educating him the right way then we will do that."